Welcome back! 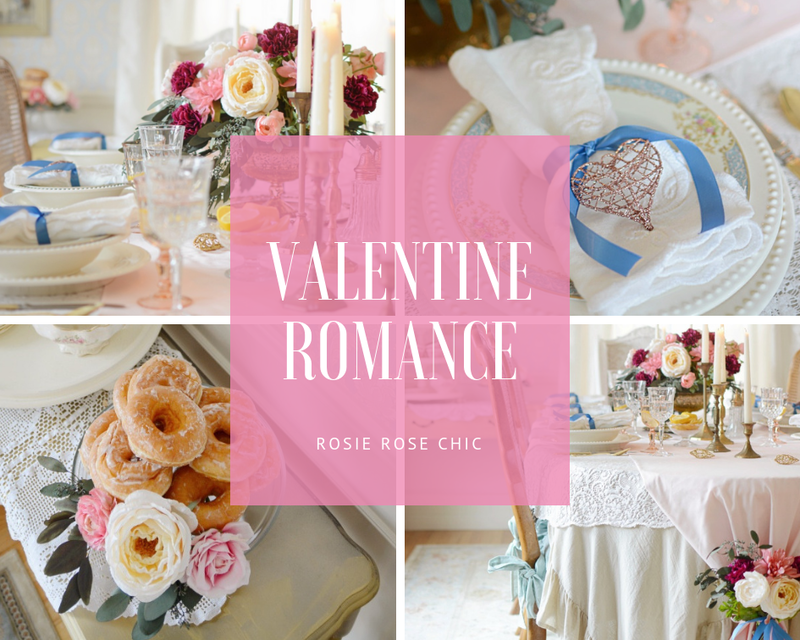 Today, I'm sharing my romantically styled dining room for Valentine's Day. I've always had a love for this day, it's a special time to show my loved ones how much I appreciate them. 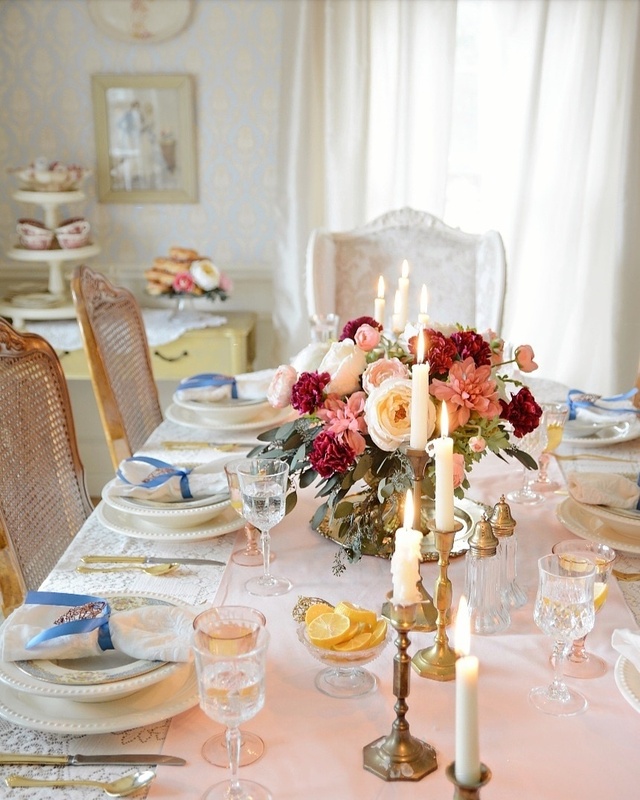 Preparing dinner and gathering around the table is a perfect way to spend this day together. 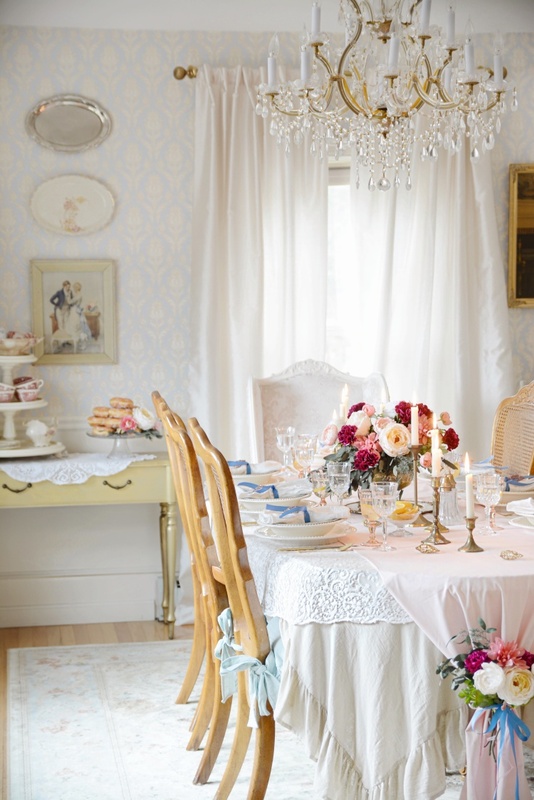 My inspiration for my Valentine's dining room came from this vintage print I picked up at an antique store last year. I fell in love with the colors and the romantic feel. 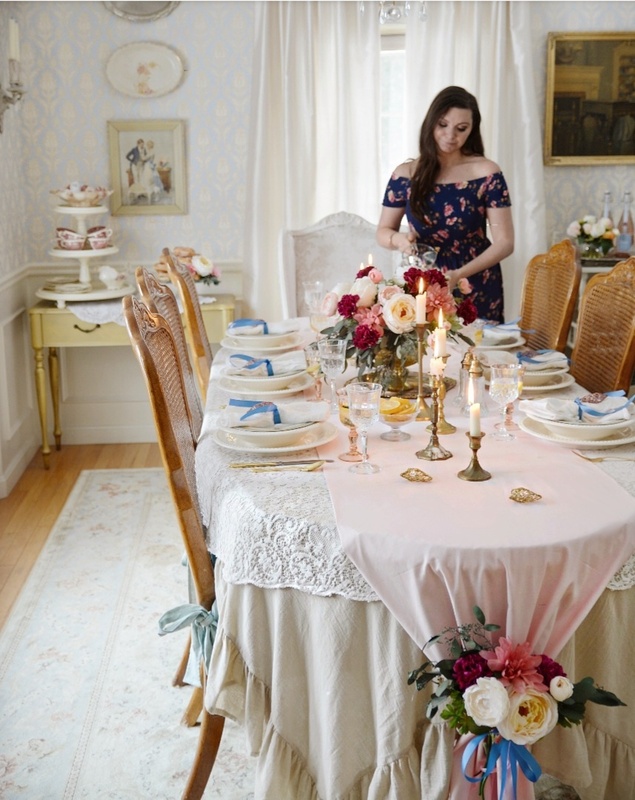 I incorporated shades of pink, white, gold, and a touch of blue, just like in the vintage print. This color combination makes my heart happy. 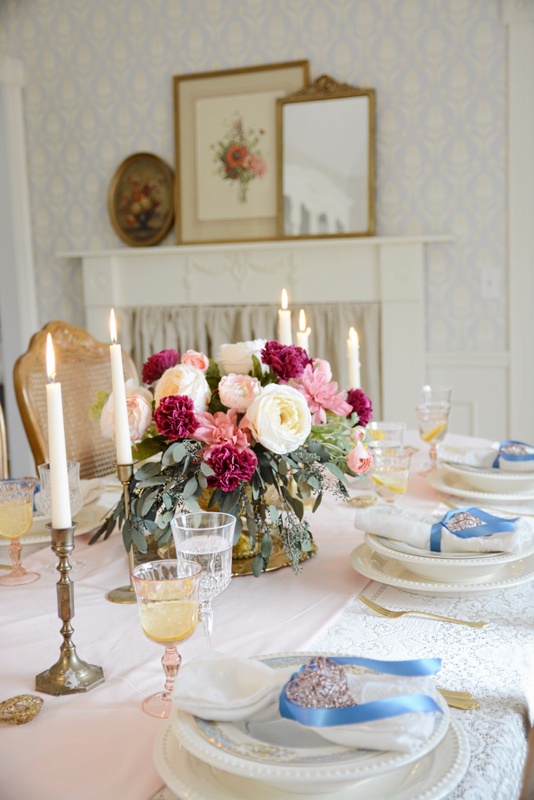 The flowered centerpiece is the focal point and I absolutely love the pedestal gold vintage style urn, which I recently treated myself to using a gift card I received on Christmas. 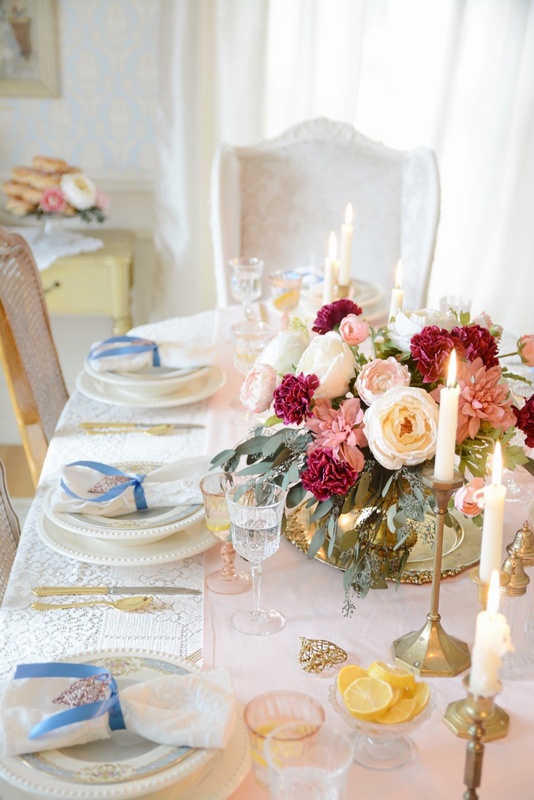 I wanted a delicate romantic feel to my table setting. 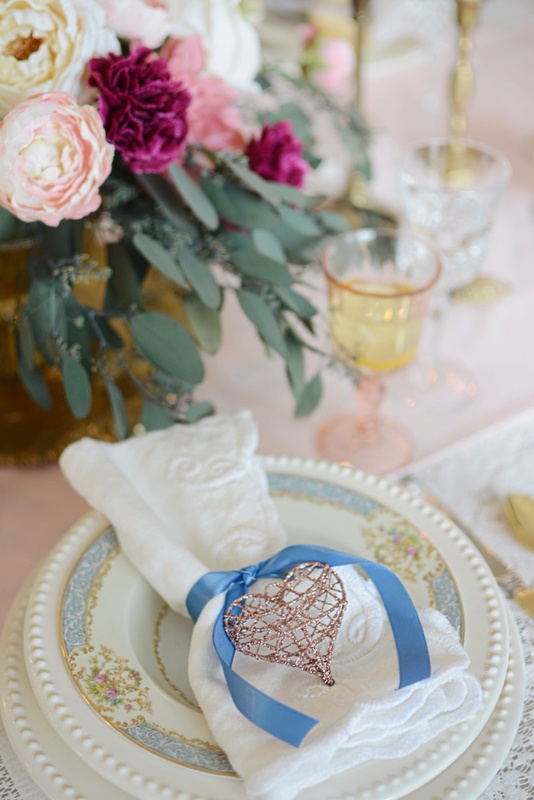 These blue, pink and gold vintage plates that I already owned went perfectly, and I added a simply blue ribbon and heart to finish off the look. 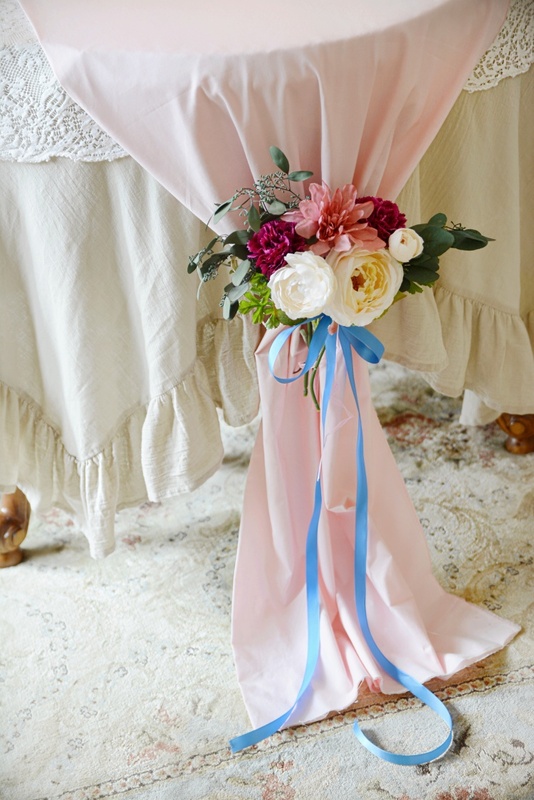 I added a pink runner that I made from 4 yds of fabric that I purchased at Walmart for $11. I added flowers and greenery that I already had on hand and tied it with the blue ribbon. 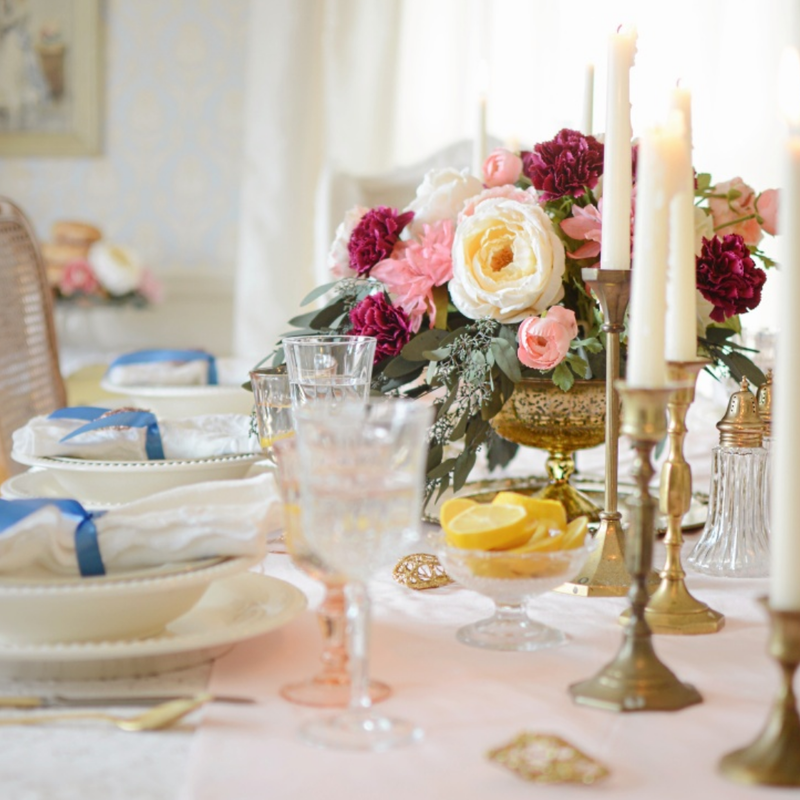 Candles are the perfect touch to pull off a romantic feel, I have been collecting the gold candlesticks over the years that I've found at Savers or yard sales for a couple of dollars each. I added golden hearts on my table runner and the pink water glasses that I found at Savers for $4.99 for 8, the lemons add the perfect touch of yellow to both. 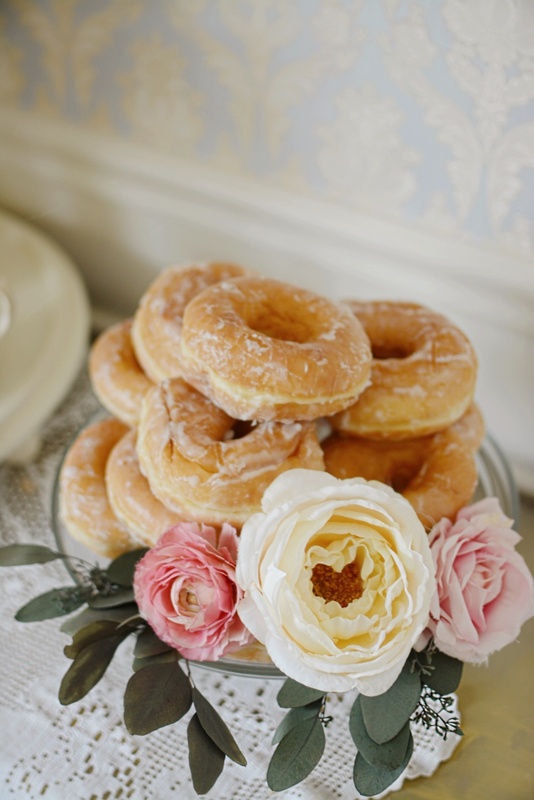 We can't have a Valentine's dinner without a sweet treat, how adorable and yummy is this donut cake my daughter and I made together? Looks to good to eat! My overall vision for my Valentine's dining room came together. I'm so happy with the way it turned out and I hope you enjoyed it as well. Thank you for stopping by, have a wonderful Valentine's day. Magazine worthy Amanda! 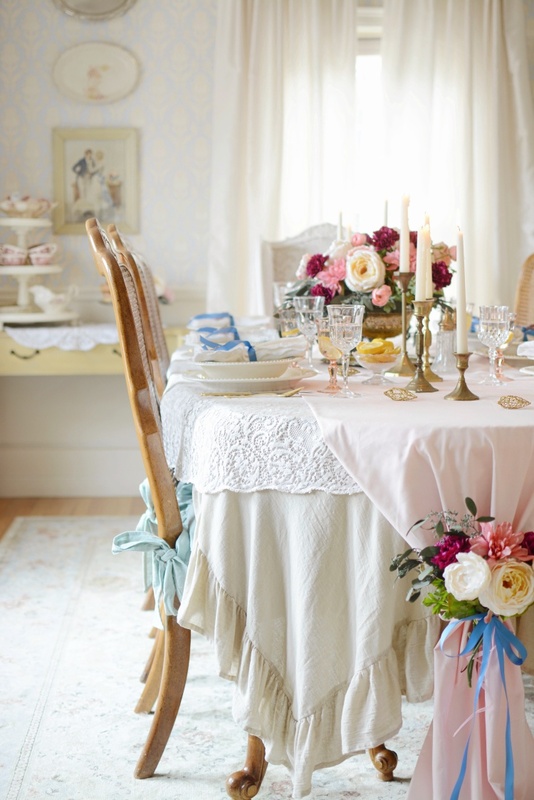 Your Valentine's day table is a breath of fresh air. 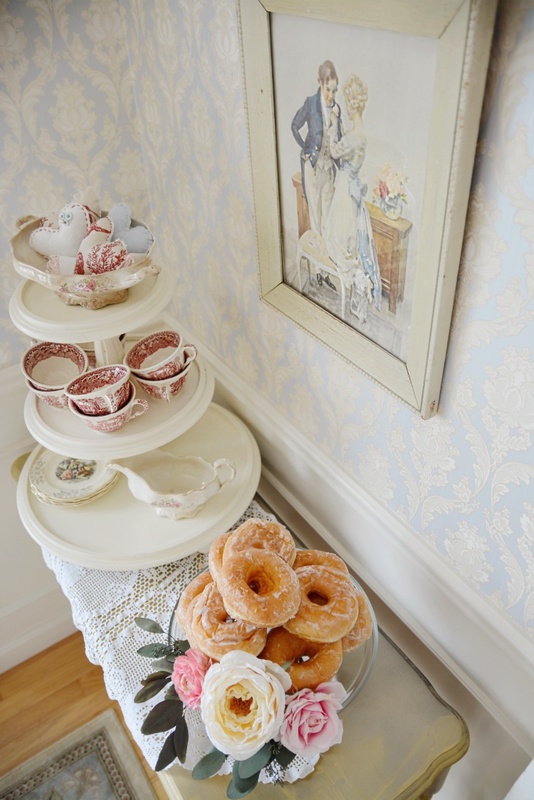 Such charming and delicate china. An elegant table without being too much. I love all the romantic touches in the room. It's a room to dream in sweet friend. WOW!!! Janet, you have no idea how much your words mean to me, you are always so kind, I appreciate it so much sweet friend. Just beautiful Amanda!!! 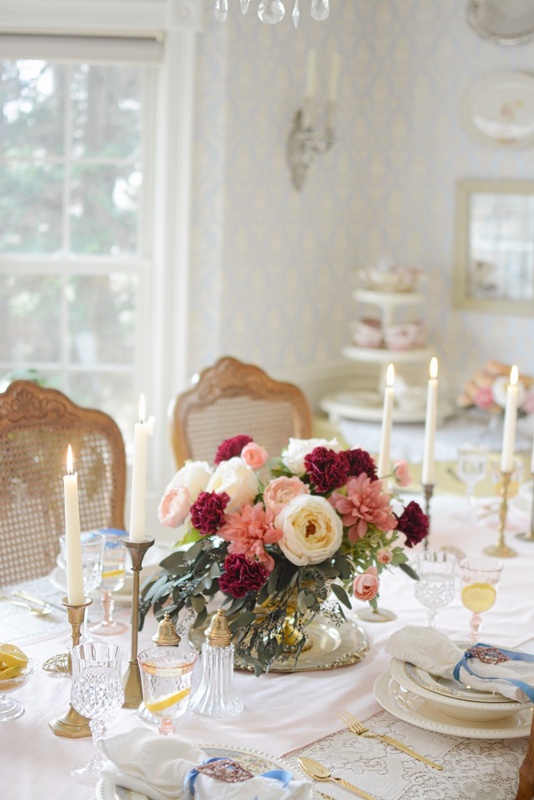 I absolutely love your valentines tablescape! 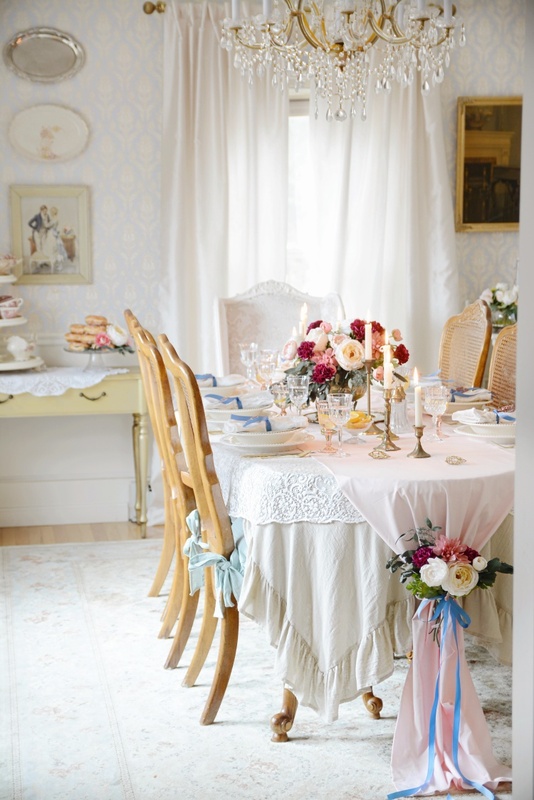 I would love to spend time in your beautiful dining room! Its absolutely breathtaking! Your photos turned out beautifully!! Awwww,Thank you so much Larissa, I really appreciate your kindness, I would love to have you over. Wow, this is a stunner! Fabulous job! Thank you so much Amber , so kind of you to say. Thank you Amber, I am truly honored.